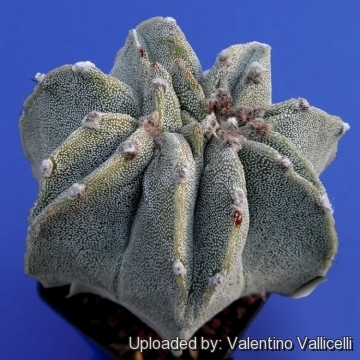 Description: Astrophytum myriostigma (a.k.a. Bishop's cap) is a spineless succulent plant, usually solitary or with very few basal branches. A transverse section of the stem reveal a perfect star shaped form (like the common star-fish) giving the plant the appearance of five pointed star. 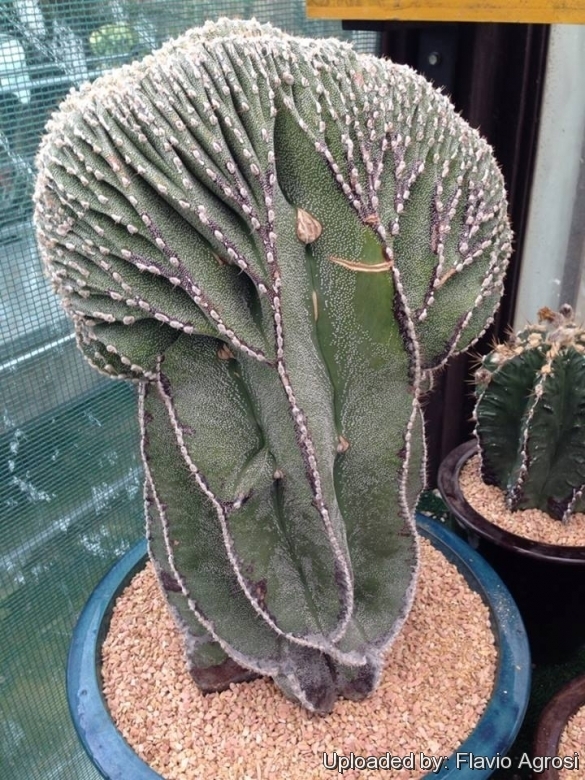 Crested form: The crested form Astrophytum myriostigma f. cristatum is very rare and sought after by collectors, for its unique features. 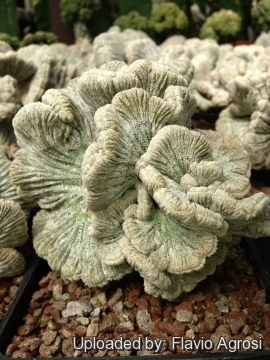 Though these crested myriostigma specimens are somewhat rare (about 1 in 100.000 seddlings), cresting occurs naturally, and can be encountered in many other cactus species. 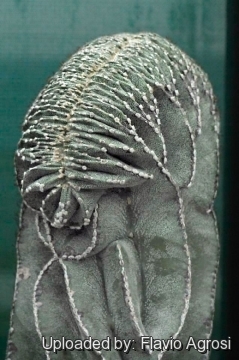 The cause of cresting is not fully explained and some speculate that it is a genetic mutation, but whatever the stimulus, the growth point of the stem has switched from a geometric point, to a line, which folds and undulates as the crest expands. 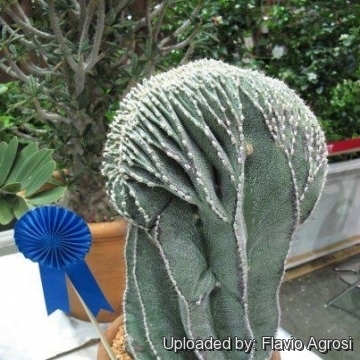 There are several crested forms mainly selected by Asian growers, mainly propagated by grafting. 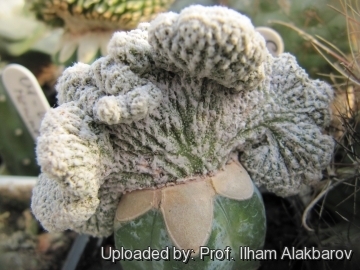 Stem: Fan shaped, bright green, covered with many minute white hairy scales that give it a characteristic chalk-white or silvery-grey appearance, but sometime naked (Astrophytum myriostigma var. nudum f. cristatum). The scales are composed of very fine interwoven hairs, which, under a microscope, are very pretty object. Ribs: Vertical, regular, deep, prominent and acute. Flowers: Funnelform, 4-7 cm long glossy yellow and sweet scented from the areole at the tip of the stem on mature plant. Blooming season: Flowers appear intermittently throughout the warm months from April to September.